Sara was very late posting her blog because holidays in retail meet food poisoning. (Sara also likes to refer to herself in the third person because it makes her feel important.) It’s been kind of a rough day. So, to make myself feel better, I’m giving away not one, but two of my favorite books!Today, you can get Lowtown by Daniel Polansky AND Angelmaker by Nick Harkaway. These are amazing books, and I’ve gushed about both of them before, so I’m not going to take the time. Lowtown is Raymond Chandler set in George R.R. Martin’s Westeros. 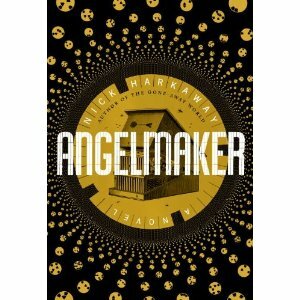 Angelmaker is a little bit Lock, Stock, and Two Smoking Barrels, and a little bit cold-war, steampunk, spy thriller. And they both rock my socks. They should rock yours too! To enter, leave a comment below. I’m too tired to think of anything clever so just tell me anything! This contest will run until December 28. Have a look back at the previous posts to enter earlier giveaways! I’ll take it. Pick me! We’ll see what the random number generator/10 sided die has to say when the time comes. The random number generator liked you, Evan, because you’ve won the giveaway! Just email your address to medusasmirror@gmail.com and I’ll get the books in the mail for you! Haven’t read either but love your descriptions. Low Town sounds especially intriguing. Thanks for the giveaway. You’re welcome! I really love Low Town. It makes me sad that the sequels aren’t available in the US.